As long as there has been magic, there have been Mages' Towers. Tall, dilapidated structures built in wild curves to tap into elemental energy. As the Solstice approaches, three Wizards break ground on what they're sure will be... Well, it will be a tower anyway. 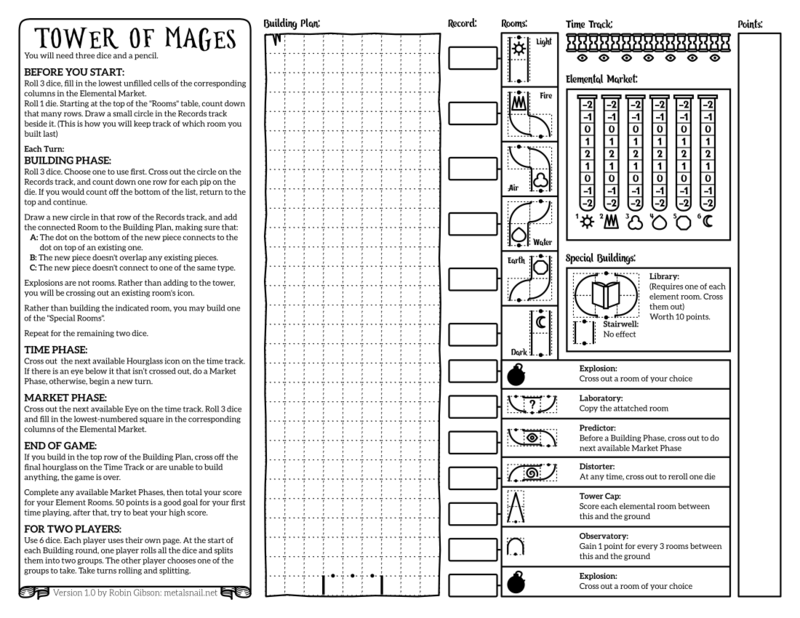 Tower of Mages is a dice game for one player. Each of your three dice represents a scatterbrained wizard with a short attention span. 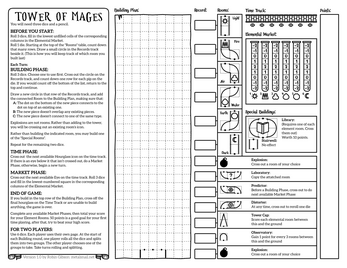 Over the course of the game they will be working together to build a tower to gather elemental energies, convert them into valuable spells, and to predict and manipulate the spell market. The game uses a sort-of-rondel mechanic. You roll your dice and choose which order to play them in. Each time you use a die, you count down the list of tower segments, starting at the last segment built. There is also a market speculation aspect, all Elements begin at a value of -2. As the game progresses, you will roll dice to see how values grow and fall. To make the best of this, you can build high value rooms, destroy negatively valued rooms, cap towers to score them early, and gain rerolls to adjust the outcomes of the market. All you need to play is this PDF, three standard dice and a pencil. I would love to see the towers you wind up with, so please, share your highscores, and scans of your completed games! If you like this, you should try my other, similar game: Hall of the Dwarven King! enjoying my first play through of Tower. Can you clarify - which elemental rooms do I score after placing a tower cap? And do those same rooms score again at the end of the game? Hey, thanks for playing, I'm glad you enjoyed it! Starting with the room directly under the tower cap, you score each room going down to the ground. And when you score rooms you cross them off so you won't be able to score them later. Thanks! It’s a brilliantly designed little game. Right, so I place a tower cap, then score and cross off each room that follows in a sequence to the ground (but not the rooms that are not in the same sequence/path). Is that correct? I have to say that I'm a bit confused by the Elemental Market. I fail to see what filling it triggers in the mechanics of the game. Am I missing something obvious? It just tracks how many points you get for your element rooms when you cap a tower, and at the end of the game.